Joyalukkas group donated Rs.2 Cr to the relief funds for the victims of Ockhi cyclone that severely affected the coastal areas of southern Kerala. The group donated Rs.1 Cr each to the Chief Minister’s Relief Fund and the Welfare Fund instituted by the Thiruvananthapuram Archbishop. 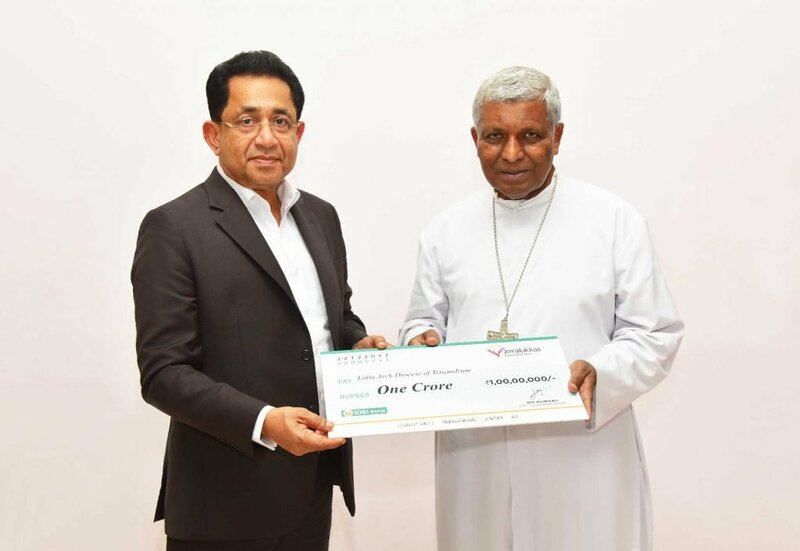 In separate functions held in Thiruvananthapuram, Joy Alukkas, Chairman, Joyalukkas group, handed over the cheques to Pinarayi Vijayan, Chief Minister of Kerala and Archbishop Dr. M Soosa Pakiam. The gesture has been the outcome of the visits by the representatives of Joyalukks Foundation in the affected areas as instructed by Joy Alukkas, Chairman, Joyalukkas group. The Foundation has also decided to help the victims further if needed. Joyalukas Foundation is the CSR arm of Joyalukkas group. The Foundation has been executing various social responsibility projects across India including constructing houses for 36 families affected by Endsosulphan in Kasargod. The prime area of focus for the Foundation is in healthcare sector, which includes conducting mega medical camps in the various districts of Kerala, which has been giving releif to thousands of people in need. The Foundation also donates more than 1000 dialysis kits every month. In addition to these, the Foundation also takes care of many of the special schools, old age homes and financially weak families in the state. The Foundation had also donated Rs.3 Cr to the Tamil Nadu Chief Minister’s Releif Fund for the 2015 Chennai flood victims.